Terry Wise, VP of channel at AWS. On stage at Amazon Web Services’ re:Invent conference, Terry Wise, vice-president of global alliances, ecosystem, and channels for AWS, stands in front of a giant pie graph showing yet another market segment where AWS is taking the largest slice – Windows workloads running in the public cloud. Though he didn’t name Microsoft Azure, he didn’t have to as its logo was clearly visible just behind him, on the second-larger slice of market share, much smaller than the mega-portion that AWS is having for breakfast. With end-of-support dates approaching for some key parts of the Microsoft on-premises stack, including SQL Server 2008 on July 9, 2019 and Windows Server 2008 on Jan. 14, 2020, many Microsoft shops will have a new incentive to consider a cloud migration. While Microsoft is offering incentives to those customers to transfer Windows licences to the Azure cloud, that’s not the choice that most are making. According to an estimate from analyst firm IDC, AWS hosts 58 per cent of Windows workloads in the public cloud, followed by Azure at about 31 per cent. An IDC infographic shows that Windows Server installations on-premises are on the decline. In an IDC infographic sponsored by AWS, more of the picture is painted. 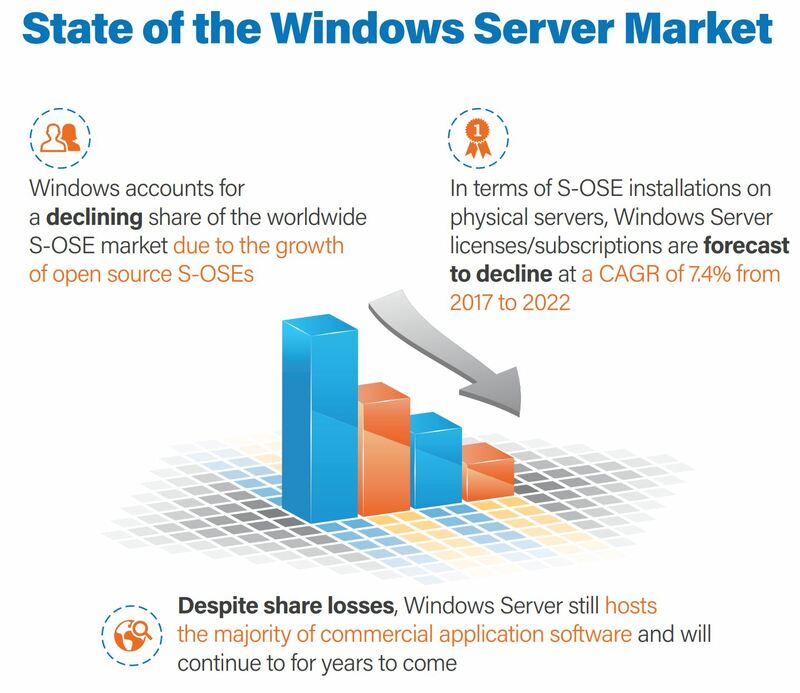 While it forecasts that Windows Server licences will decline slowly to 2022, it also acknowledges that Windows Server still hosts the majority of commercial application software for years to come. So it’s no wonder that AWS is actively marketing to customers that find their servers are nearing end of life, and encouraging partners to help migrate those users to AWS. It’s not exactly a risky new approach either. Both Windows Server and SQL Server have been available on AWS for 10 years as of October. In a blog post celebrating that anniversary (I don’t think Microsoft got a card), Sandy Carter, vice-president of Windows on AWS and enterprise workloads highlighted some customers in a blog post. The family history website Ancestry runs 6,000 Windows workloads on AWS. NextGen Healthcare runs its SQL Servers there, as does market research firm eMarketer. So why do so many companies opt to run their Windows workloads on AWS when Azure is an option? The answer is the same as why customers were buying other vendors server hardware to run Windows workloads back in 2008. They just don’t see the underlying infrastructure and the software layer as being important to unify. What’s important is that the support for the software layer is in place, there are controls for licencing costs, and that the performance is good. With a vast partner network certified on supporting Windows on AWS, the support for this service is now quite mature after being introduced a decade ago. AWS offers many of the same incentives that Azure is using as a carrot to convince customers to come to its cloud – for example, there are options to bring the licence you already have to the cloud environment. Additionally, AWS allows customers to simply “pay as you go” turning on the appropriate number of server instances as they’re required, and scaling back down when they’re not. Measuring performance on the platforms is complicated and has to be done with specific client requirements in mind. Perhaps intentionally, AWS and Azure offer different tiering options for their SQL services and have different approaches on how to charge for their services. Outside of a direct comparison between AWS and Azure for hosting Windows workloads, it’s possible AWS is attracting the larger market share simply because it offers more choices to the customer. Just at the database level, for customers that are using more types of databases beyond SQL, AWS will be more appealing for offering those options. With Azure, there is more incentive to offer up software that results in the sale of more Microsoft licences, so there are fewer database engines available.